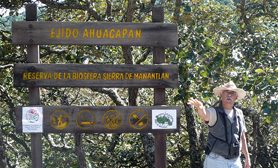 The Sierra de Manantlan Biosphere Reserve is nestled between the states of Jalisco and Colima. The effects of tectonic and volcanic activities and erosion are notable within the reserve. Different types of forests are present in the reserve including mesophytic, cloud, and dry deciduous and semi-deciduous tropical forests. Anthropologists know the region of Sierra de Manantlan as ‘Zona de Occidente’, an area notably different to the rest of Mesoamerica. Some ceramic remnants, figurines and graves have been found, but there is little other material evidence. 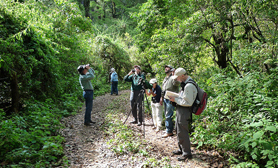 The reserve, which protects the Jalisco dry forests, shelters over 2,700 species of plants (40 percent of all plants native to Mexico) and about 560 animals. The biosphere is one of the most ecologically diverse areas in North America.